Um, Mr. Ivey, there’s a mountain of cash by your feet there. This picture was actually the first one mentioned by a number of panelists. It resonates. 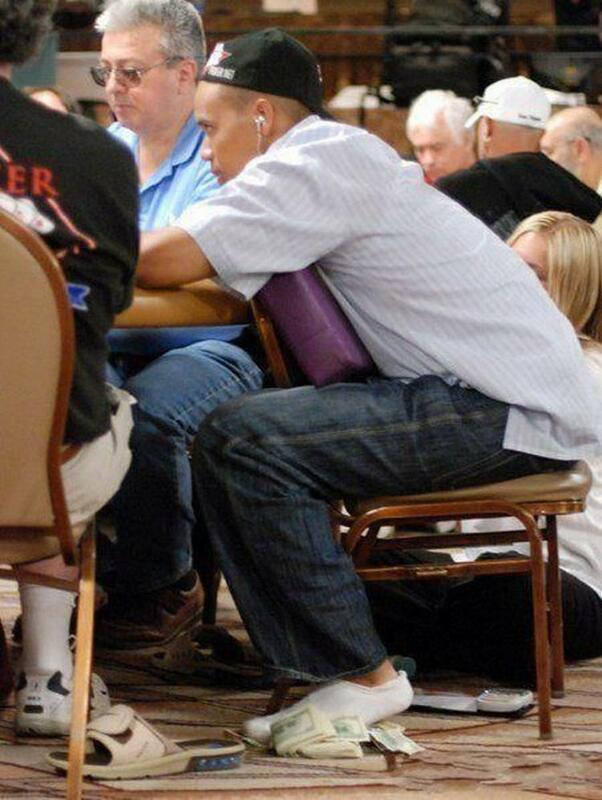 Our #3 Greatest Poker Pic of All Time is Phil Ivey at the WSOP with a wad of cash at his feet. #tbt This pic has been around for a while, truth is I don’t think I knew the money was there. So if Ivey doesn’t even remember the money being there, then the cash certainly didn’t resonate with him. We then polled some high stakes players and industry execs for their thoughts on the cash stash. The low-end estimates were $15,000. The high-end estimates were consistently $25,000-$30,000. Since the low-end were fairly confident snap-calls from people who would know–we’ll give that more weight and say you’re looking at $15,000 at Ivey’s feet. How exactly can $15,000 be loose change for anyone? Easy. We believe this photo was taken at the 2008 WSOP, possibly at the $1,500 Razz event (Archie Karas, who is in the photo to Ivey’s right, final tabled the event and Ivey played it). In 2008, Ivey reportedly made over $900,000 monthly in Full Tilt distributions. That year, Ivey made just over $7M online. He had just over $2M in 2008 tournament earnings. To keep things simple, let’s say he profited $1M in live earnings and simply broke even in cash games (unlikely, by the way, as Phil Ivey crushed live cash games). That would’ve put his 2008 earnings around $18,800,000. His monthly intake would’ve been over $1.5M. Using some loose math math math here, that $15,000 at his feet would’ve been just less than 1% of his monthly take home. To put this further into perspective, pretend you’re an accountant banking $10,000 a month. That would be like you leaving $100 on the ground by your feet. That’s how insignificant that money was to Phil Ivey. If I were to show my non-poker friends one photo to sum up our industry, it would be this one. They don’t really grasp how much money is passed through the tables or even that people can make a good living playing poker. My friends wouldn’t leave $100 casually by their feet, let alone over $15,000. Well, maybe my drug lord friends, but the rest wouldn’t. I sincerely can’t remember if this was 2008 or 2009, but this Ivey photo came about during our standard pass through a WSOP field. At PocketFives Live, we only covered players with P5s accounts, so the evening events were always a struggle to find pictures, since most of the online kids weren’t playing mixed games back then. As I combed through the field with a camera, I noticed Ivey sitting there in his socks, and I noticed a giant wad of cash on the floor. I went to my colleague, Brett Collison, and had him take a look at what was going on. “I don’t think he even knows it is there,” I told him. 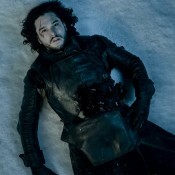 “He hasn’t looked down once. But how did it get there? Did someone leave it there for it and he didn’t notice? Did it just fall out of his pocket? Did he find this wad of cash in his jeans uncomfortable, drop it on the floor, and just forget about it?” So, even though we normally didn’t photograph the big pros, I snapped this photo and put it in the gallery, while I believe Brett wrote a post about it because it was just too absurd to pass up and, when it comes to Ivey, he kind of transcends the standards that get applied to everyone else. And that, ladies and gentlemen, is our industry. 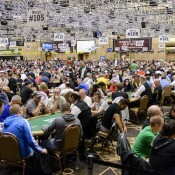 We’ll conclude our 20 Greatest Poker Pics of All Time series tomorrow with the top 2. * We believe the photo credit on this goes to Pocket 5’s, as many of the early versions of it included the P5’s watermark. If you know the exact originator, please let us know. UPDATE: Photo Credit goes to none other than Jess Welman.